With a population of roughly 60,000, Alpharetta ranks as the top small city for businesses because of its ability to attract companies large and small, according to NerdWallet and Entrepreneur. Alpharetta has 15 businesses per 100 people, roughly 65 percent above average, which generate $6.9 million average revenue per business, according to the July report that examined cities with populations of 50,000 to 100,000. Not long ago, its neighbor to the south, Sandy Springs, was named the Best Small City for Startups in Georgia by Bloomberg BusinessWeek. Living up to its nickname of “Technology City of the South,” Alpharetta is home to nearly 600 tech companies and continues to grow. Its unemployment rate is lower than the national average, and it offers a broad network of fiber optic data lines and download speeds that are 60 percent faster than the national average – a crucial factor for finance technology companies, according to a recent Inc.com article. 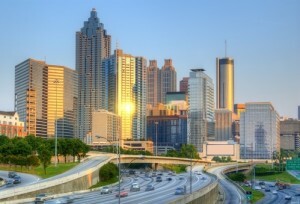 Because they’re less than 30 miles from Atlanta, Alpharetta and Sandy Springs also have access to talent from Georgia Institute of Technology and major venture capital firms like Invesco, which is based in Atlanta. Alpharetta’s median household income is very strong at $86,703. However, its cost of living is high: the median home price is roughly $329,800. Some of the area’s strongest business support comes from the Alpharetta Tech Commission, which launched in 2012 and received seed funding from the City of Alpharetta. In August, the commission opened its ATC Innovation Center to foster mobile technology development and co-working. Other co-working space in Alpharetta includes Roam Alpharetta and Thrive. The state’s first medical business accelerator – Emergence – is also based in Alpharetta. Its 12-week boot camp connects promising young companies in the areas of medical devices and data systems, health information technology, and biosciences with resources, education, mentoring, and capital. To help provide a highly skilled work force in the areas of technology and life sciences, the new Gwinnett Technical College campus in Alpharetta will start offering classes in January 2016. Employee tax credits also attract new and existing businesses to the area. Several cities north of Atlanta, including Alpharetta and Sandy Springs, have the Opportunity Zone Job Tax Credit Program, which provides a credit of $3,500 per new employee for businesses that create two or more jobs. Your business can seem more approachable by selecting a local phone number in the 770 area code, which serves Alpharetta, Sandy Springs, and other suburbs of Atlanta. With Halloo you can route calls to your employees anywhere. Get your local phone number today!